Highlight videos from this weeks World Cup in Germany! 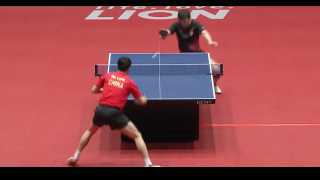 ITTF video people: "Hey, how can we make the viewing experience even worse than before? How about we take the brightness down a few stops, decrease the contrast and frame them further away...and push them to the top of the screen.". "How about a subtle blur filter too?" - "Yeaaaah go for it". Last edited by CroneOne; 10-02-2016 at 08:09 PM.